This is the new edition of a popular guide and it is fully updated with all the latest names and recently recognised species. The Himalayas, the world's highest mountain range, are a birdwatcher's paradise. Many of its species are high altitude specialists, including Tibetan and Himalayan Snowcocks, Snow Partridge, Ibisbill, Tibetan Sandgrouse, Hume's Groundpecker, Tibetan Snowfinch and Great Rosefinch. The area comprises a mosaic of different habitats which host a huge range of avian species, with families such as raptors, gamebirds, flycatchers and warblers particularly well represented. 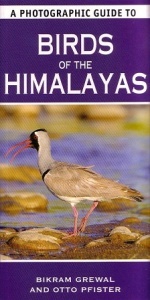 252 of the Himalayas' most interesting and spectacular birds are featured in this concise and easy-to-use guide, and each species is illustrated with a colour photograph which is accompanied by text giving key information on identification, habitat and distribution.